I was working with a customer who had no real .Net expertise, but needed to get up and running quickly with Sitecore. 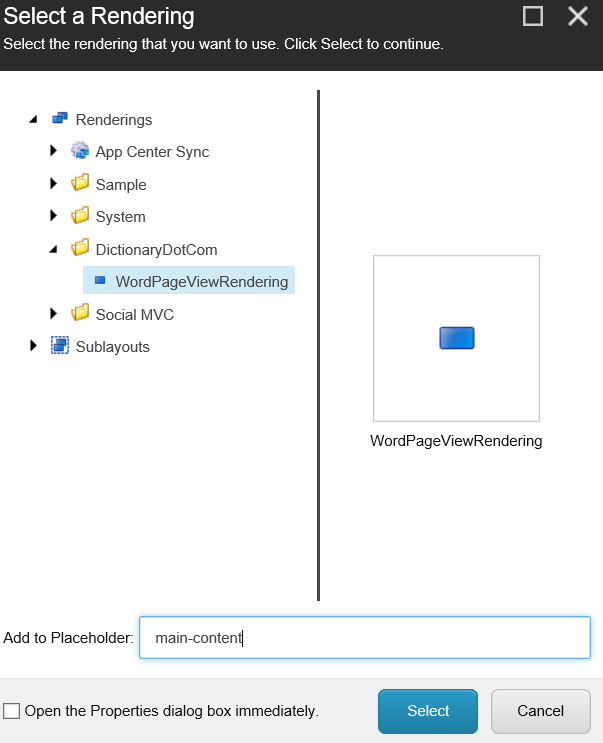 The concepts of MVC were familiar to the customer, so it made sense to introduce them to Sitecore ViewRenderings and all that can be done without compiling any custom code in Visual Studio. 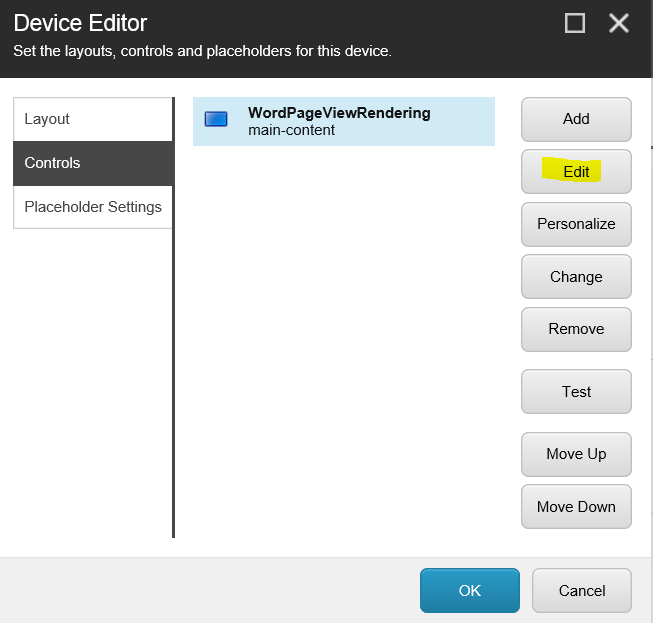 Sitecore ViewRenderings connect with Sitecore content to define a Model item by convention, requiring no custom configuration on the part of the customer. What follows is a basic example illustrating what can be done with Sitecore ViewRenderings without any custom code compilation. I take things from the top with a clean Sitecore 8 install, since the customer was new to the Sitecore platform . . . 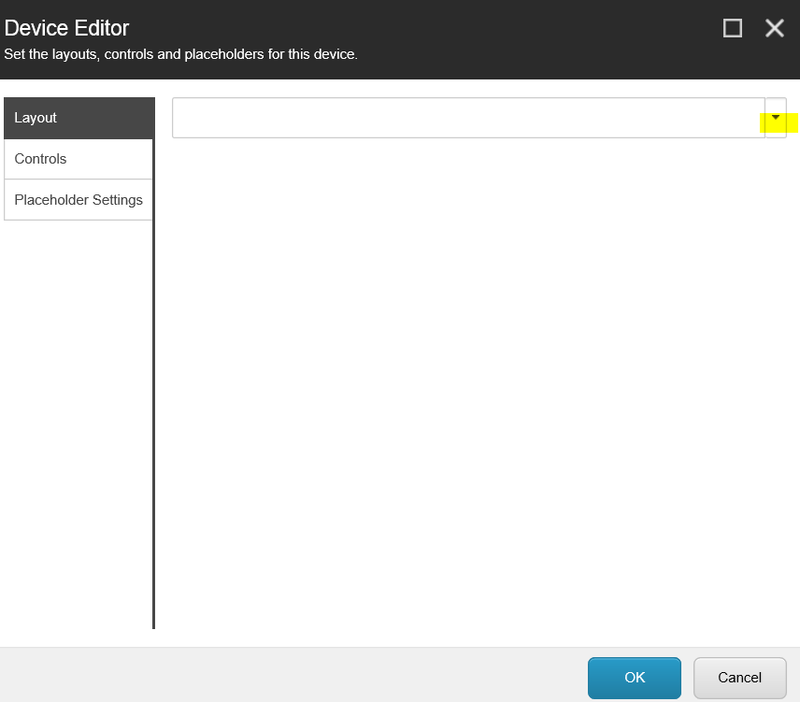 Taking a fresh installation of Sitecore 8.0 rev 150223, one defines the Sitecore templates that will represent our content. 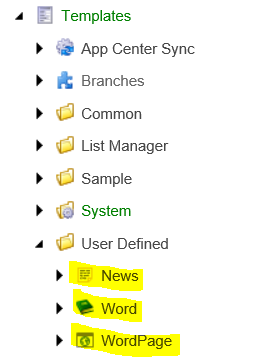 As the picture below shows, we’ll add three templates under the Sitecore/Templates/User Defined area of the content tree: News, Word, and WordPage. The News template will be for an example of querying a list of Sitecore content, and for simplicity we’ll just define a single field named “Headline” for that template. The Word template will contain fields for Title, Subtitle, and Image – in our example we’ll pick from a collection of Word items to associate with our sample page. 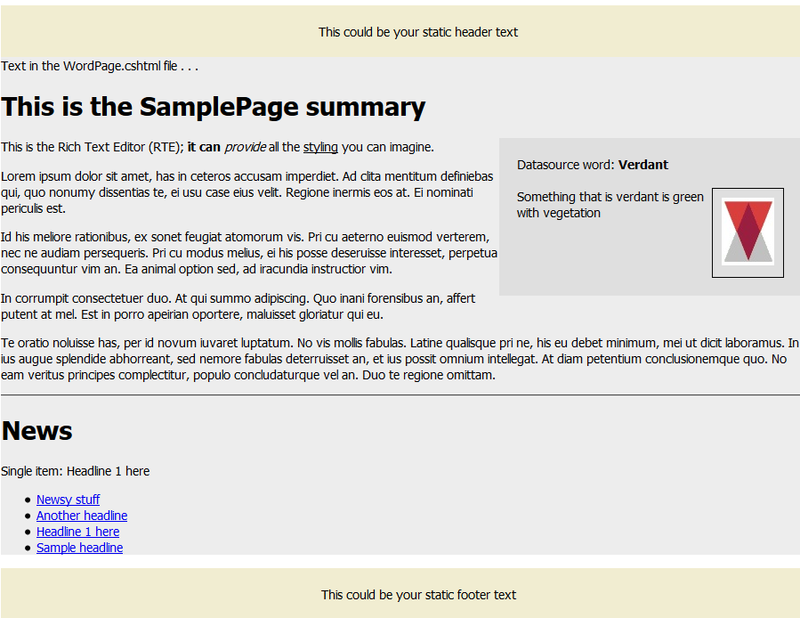 Finally, the WordPage template will be be the container that represents the page on the website. 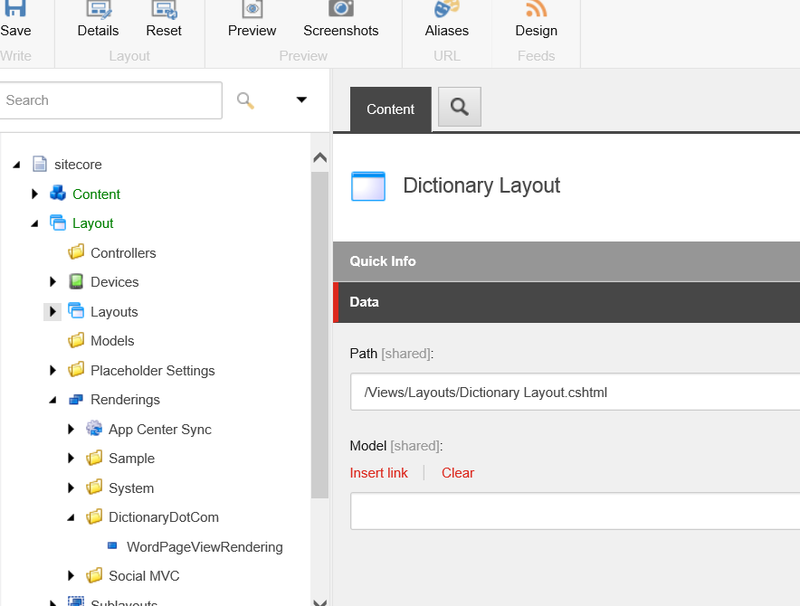 This shows a “UI Template” approach that is common; implemenations of Sitecore will usually have templates defining the structure of the data (such as our News and Word templates) as well as UI only (such as our WordPage template). Once this example is finished, it should all make more sense. To customize the icon used for these templates, I used the Icon button on the Configure ribbon in Sitecore. This is optional as the icon doesn’t impact the functionality, but it makes life easier for content authors. 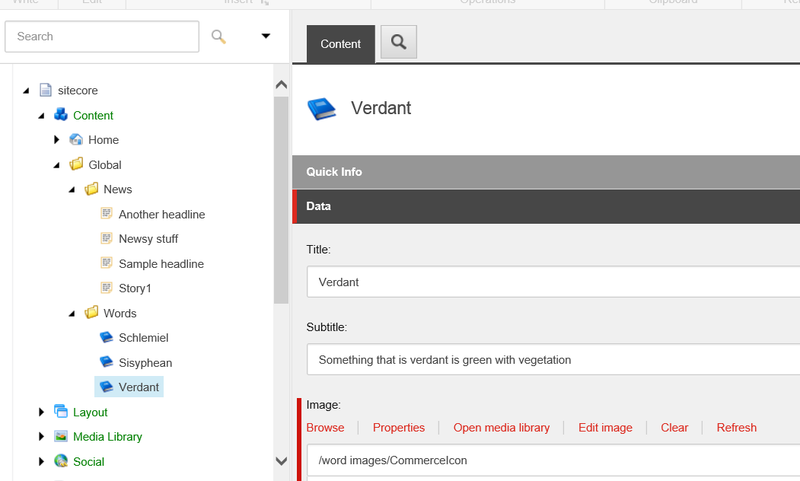 In the Word template we defined an Image field and specified the source as /sitecore/media library/word images. We need to create that folder under the Media Library and upload some sample images into it. The following screen capture shows that I placed 4 images in that directory. For what we’re doing, you can disregard the red “1 warning” messages as this relates to image alt text on the media items. In the Sitecore content tree, under sitecore/content I create a new folder named “Global” to hold data that is common to the entire implementation. I create News and Words folders under this Global folder. I created a few sample items under the News folder of the /sitecore/templates/User Defined/News type, and sample items under the Words folder of the /sitecore/templates/User Defined/Word type. 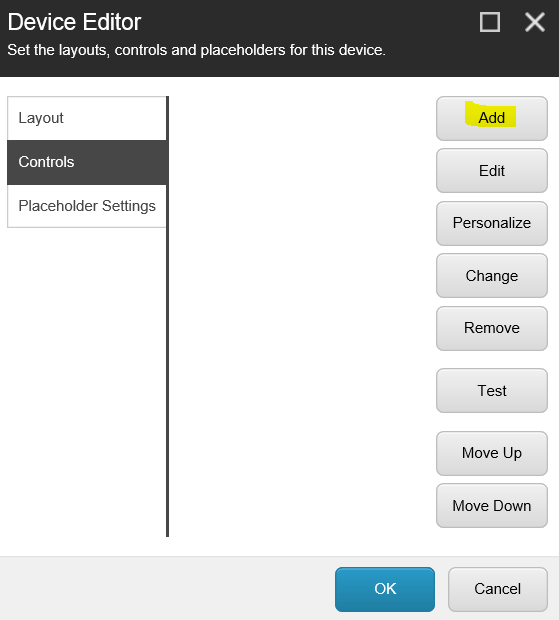 Populate each field of these sample items with data so our example has content to display. Be sure to name one of the News items “Story1” as that’s hard-coded into our ViewRendering (discussed later on). 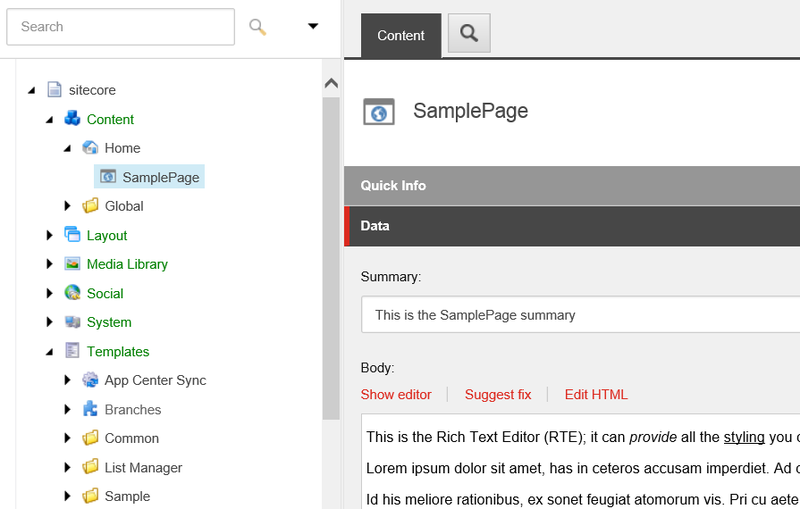 Under the /sitecore/home location in the content tree, I created an item based on our /sitecore/templates/User Defined/WordPage type and populated the Summary and Body with sample text. After saving this SamplePage item, if you do a Sitecore Publish, this page will be accessed by the URL http://%5Bserver name]/SamplePage. At this stage in the process, however, there are no Sitecore Presentation Layout Details that associate HTML markup with this content. All we have right now is the skeleton. One would see the Sitecore error page if one tried to view http://%5Bserver name]/SamplePage at this juncture. A special Web.config file that enables MVC for this Views directory, I will send you a .zip file with the Web.config to use. Hard-coded text in the WordPage.cshtml file . . . I used Visual Studio .net to author this file, as the color highlighting is helpful, but this could be done in any text editor. I’ll hold off on explaining each part of this file for the time being, but this is the only logic one needs to use the default MVC ViewRendering in Sitecore. No C# class files and no compilation is necessary. I’ll hold off on explaining each part of this file for the time being, but this defines the basic HTML for the site and through the “main-content” placeholder our WordPage.cshtml can be inserted. 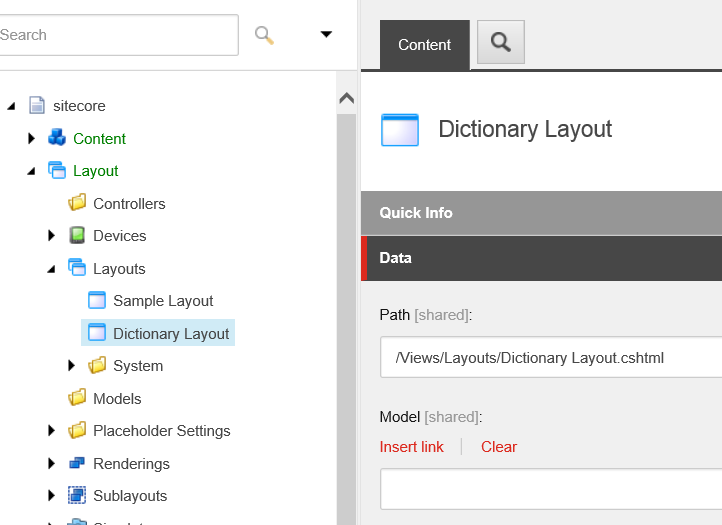 Under sitecore/Layout/Layouts create a new item of the /sitecore/templates/System/Layout/Layout type and specify the path to be /Views/Layouts/Dictionary Layout.cshtml. 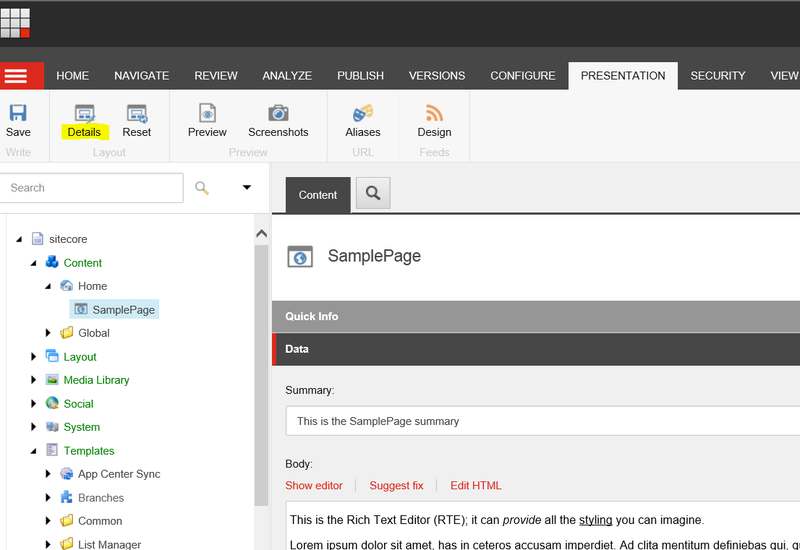 With the physical .cshtml files in place and the Sitecore presentation items defined (the layout and the ViewRendering), we will set the Presentation Layout Details on the /sitecore/content/Home/SamplePage item. 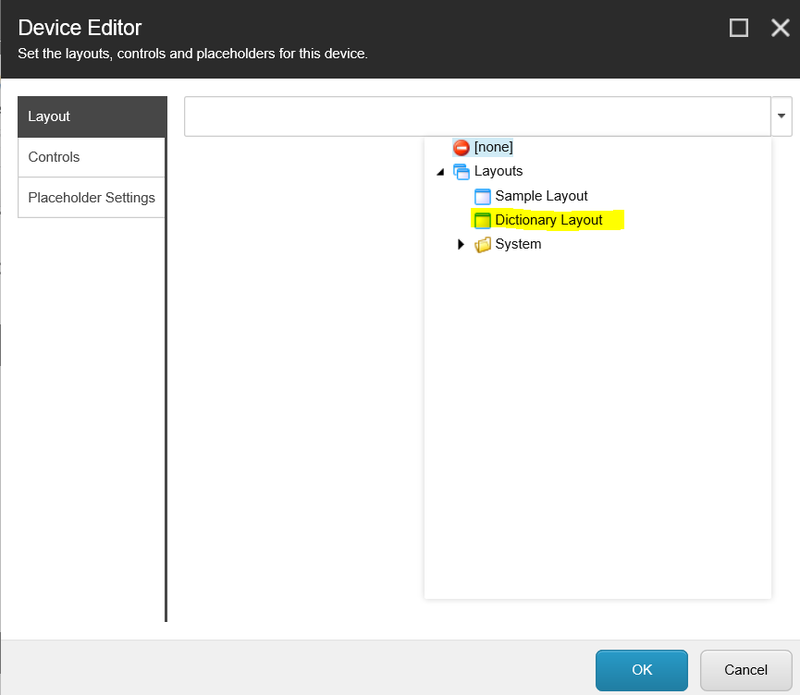 On the Control Properties screen, choose to define a Data Source via the “Browse” link. Select a Word in the sitecore/Content/Global/Words folder. This is how one defines a Datasource in Sitecore, and the ViewRendering will make that selected Word item available via the Model.Item property in the .cshtml file. Click OK after choosing a Word. Click OK a few more times to accept all the changes we made to the Presentation Details.